Because new workshop teams are emerging, we thinking that one approach to the task is to compile some Do-It-Yourself Promotional/Marketing strategies that each workshop team can use as a guide to promote and raise fund for their workshop by themselves. So read on, go through all of the posts below. Choose the strategies that you are likely to have most success with, and personalized them to your workshop. Then create a press release to announce your workshop. One way to let your entire community know about the life-changing adventure you are about to embark on is to create and send out a press release. This can help to bring in financial support, while drawing much needed public attention to the cause you will be working on during your stay in Ghana. Send the press release to your local newspapers, radio stations, Online media and newsletters asking them to help spread the word, direct people to your fundraising page and encourage the community to support your Ghana Project. The press release should be written by you and needs to contain all the pertinent information about your endeavor. A press release is a written statement to the media about your Ghana Project in a way that is newsworthy, while seamlessly soliciting donations- such as availing opportunities for public presentation about your project and saying the amount you must raise to go to Ghana. It should be motivational, a call-for-action. To make your press release impactful, consider the following: How would your design response to the rural/sustainable development issue refresh or change the rural world? Briefly explain your project and the social problem/cause your project is addressing. Include pictures of yourself/design solution and your destination. Why must others care that you go? That is, what global lessons and professional/social implications will your participation in the project in Ghana bring to the global marketplace ideas or practice? Sending out the press release in your home town is an effective way to solicit donations by publicly getting the word out on your plans to volunteer abroad. Follow up with the publication staff to see if they need more information and when the story might be printed. See an example of press release on our previous project: prlog.org/11205664. You can also google “sample press release” as a model for your own fundraising efforts. It should be at the maximum, a page long. If you desire, the staff at Nka would be happy to review your press release before you send it to the newspapers. As you find successes, we invite you to post examples from the successes of your efforts, documents and useful links to Online resources that will help other teams or participants achieve this objective. Promote the results on professional platforms via published project report, conference presentation, etc. NOTE: Event promotion is about reaching potential participants and driving them to the event. To maximize the results, we want to use both traditional, offline tools and and online resources. How can your team promote your workshop to attract 16 to 20 international participants? On this page, we have listed some common ways to accomplish this task. As you will read below, some workshop teams would be able to recruit participants by creating a page on Facebook event, www.travbuddy.com, or www.meetup.com and inviting the target population to visit the page and register to participate in the workshop. Even so, your choice of marketing strategies to reach the goal, would be according to your preferences and in line with the specific skills or knowledge you are brining to the table. At the moment, we promote our workshops by designing an announcement poster, emailing to our mailing list, listing our program in websites including career services website at some universities, and by publishing the project report. Often, we publishing a press release. In light of this, your workshop team will have to share the announcement through your own networks- Facebook, email, and other ways of organizing a community around your Ghana workshop. Ask if you can pin the workshop announcement poster on community bulletin boards in local grocery stores, schools of architecture & design, or similar places in your city. It will help if you position yourself as an expert (or one on verge of it) in your industry in light of your greatest strengths and best practices that you are bringing to the workshop. Read your local newspapers to identify a reporter who covers the community beat. Pick up the phone, ask for the reporter and make your 1 minute pitch based on your checklist. They may want to come out and interview you. This gives you a list of all the institution's that offer this course and you can reach out to their student database. This is an invite and basically it needs to be succinct with the details of the workshop, venue, costs and any details about the area in terms of travel details. For example have enlisted the Department of Foreign Affairs website for more details on travelling to Africa; with the Ebola crisis. This gives you a simple execution model for now. Free Listings: in newsletters, newspapers, websites, discussion boards, blogs, radio (as public serve announcement), magazines, etc. To accomplish these, you need your message to be persuasive and consistent. Consider the following while writing the message: What is the cause that the workshop advocates? 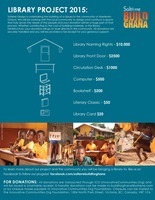 What makes this project a big deal for you and for the people in rural Ghana? Be clear, have a consistent message. Start by identifying the relevant resources in your city such as architecture schools, earth building associations, guild of architects, sustainable practitioners, as well as organizations/groups who have a heart for Africa. Then, send them the announcement. Ask them to post the poster and pass on the information to others in their networks. After a week or so, follow up with another email, phone call, skpye call, or a visit. Once you have several people who are interested, it is time to have a group meeting to answer their questions, and take applications. Fix a time and a place for the groupmeet. What time? Lunch time? After dinner? Weekends? Pick a time when the majority of people can make it. You may even announce the meeting in newspapers, radio, campus media, and other resources that will cost little or no money to attract more participants who would like to participate now they know about it. How do you use social media to build a community of potential participants in your mud house workshop for Ghana? The first step in social networking is to build a community of people who care about what the mud house project has to offer. You can do this through use of a Facebook, Twitter, Travbuddy, LinkedIn or Google+ page or all of the above. But you must provide share-worthy and useful content that’s relevant specifically to the audience you want to reach. The more your content (on any social network) gets shared, the more eyes see it and want to be a part of the community. Be aware that if you consistently produce enough engaging content, people naturally gravitate toward your cause. A starting point is to take an activist perspective by publish detail about your workshop and the cause behind it, keeping in mind the design problem the mud house design competition seeks to resolve. Posting the announcement poster and its text may not be enough. State your own cause! They would wish to know: What is your own cause? What is your philosophy of architecture? Why should we care? What’s in it for you and for the rest of us? For Nka Foundation, the design problem behind the Mud House Design 2014 is a part of Nka’s ongoing project of “tapping of local resources for sustainable development” in underserved communities in sub-Shara Africa. Since 2008, Nka has been exploring this topic through use of the arts and earth architecture projects. Travbuddy is a social networking website specializing in connecting travelers. The site allows users to find travel buddies planning to travel to the same places at the same times, create travel based blogs, upload travel photos and review bars, restaurants, hotels and attractions. Use a Facebook page to create your event and add your personal profile as a host. Creating your event through Facebook is one of the easiest way to publicize your gathering and to get as many people as possible to sign up to attend. Clarity! The most important thing is that people actually know what they're signing up for. If you can, make everyone involved in the event a host to your event. Invitees can see all of their friends who are attending. Those hosts can help spread the word about your event. The true attendee number can be seen a lot easier. A post into your event wall notifies everyone who has been invited. Post pictures, past videos, reviews and articles written about the event. Share the Facebook event with all of the local event bloggers such as Patch, Scoutmob, Waze, and local newspapers. Two thing to note about Facebook Events: (a) The image on your Facebook event banner is prime real estate. The maximum dimensions are now 180px by 540px. We recommend taking up all that space. And (b) you’ll want to make it clear there is a link that Facebook users need to click in order to register for the event. Some people might think that by clicking the “I’m Attending” button they have signed up for your event. Write periodic updates and messages on the Event wall to encourage everyone to engage and share. Facebook requires that you use the click, click, click approach. Mass inviting people with no relevancy to the event is considered spam. Include a “Share on Facebook” badge in all your promotional emails! 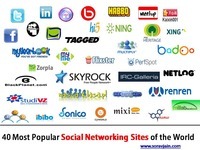 Google+ is mostly used to share web related content. It combines the best features of both Facebook and Twitter. Google+ allows you to create your own web identity, connect with friends and follow other interesting people. Google+ lets you to easily sort your contacts into groups which allows you to control who sees what, create a group for your family, a group for your friends and put your boss in his or her own circle. LinkedIn is an online social network for business professionals, which is designed specifically for professional networking, to help them find a job, discover sales leads, connect with potential business partners. There are more than 75 million professionals registered on LinkedIn. African Film Night: Hold a film night showing a best film about Africa, with invitation to everyone you know and Africa oriented business and groups – charge entry fee and sell drinks or popcorn (or some African snacks) to boost your fundraising. Display the presentation boards about your Mud House Design entry. Challenge a donor to match the funds you raise or ask a corporation to match the funds you raise. Letter Party: Pick a letter from the alphabet and base everything around that letter such as dress code, quiz, food, drinks and music. Party the day or night away, inviting everyone you know. Charge an entry fee and make it double for those not in dress code. Your choose of letter can orient Africa such as "M" as in mud, "G" as in Ghana, "Z" as in zebra, etc. Tournaments: Organize a tournament of your favorite sport, charging teams some fee to enter and offer prizes to the winners. Yummy Cake Sale: Bake some tasty treats to sell to friends, family, colleagues and community. Car Boot Sales: Raise money while getting rid of all those unwanted bits and pieces. The Ripple: Ask ten friends to each ask ten friends to donate $20. We received numerous inquiries from ambitious architecture students and volunteers who wish to come to Ghana to take part in the project, and some of them say that fundraising is their major constraint. Some of our prospective participants have little experience in doing trip-based fundraising to cover the costs of the project, airfare, land transportation and subsistence while in Ghana. This is why we are posting these fundraising tips. We think it is best that you choose the fundraising approaches that you are likely to have most success with, and personalized the examples below to your project and self. Before you ask for money and/or other resources for your Ghana Project, it is necessary to have in place the following programmatic components: (1) A clear vision of what you want to do and why. ("If the cause is right, the means will come.") (2) A clear and logical plan for how the vision will be achieved and who will play which roles in the project realization from conception to completion. (3) A clear and explainable idea of how much your project will cost and how the funds will be managed, as well as a commitment to excellent management and clear reporting procedures to your donors. In general, we suggest diversity in your fundraising activities by combining two or more methods as possible such as email fundraising letter, press release, crowdfunding, art exhibition/arts performances, project deputation involving presentations or speaking engagements, and others out there. For example, it is advantageous that you raise a part of the total cost of your Ghana Project through email fundraising letter or project deputation and use the amount realized as a base and validation to raise the rest through a crowdfunding platform. Writing a fundraiser letter is one of the most simple and effective methods of raise funds and grow a community of supporters around your project. A variation of this is a fundraiser poster (see an example by Solterre below) sent with a personalized note to the recipient. Presented properly, a fundraiser letter works surprisingly well! Go with a heading, such as KENDRA'S GOING TO GHANA and GET MARWA TO GHANA, and explain how your project bears a significant innovative content or cultural or social impact. Then, explain the ways they can help you reach your target. The key is to start early, write a persuasive letter, and send it to 10 times the number of people, businesses and institutions needed to reach your goal. Make a list of relatives, friends, colleagues and local companies you know who may support your fundraising campaign. Include everyone you can think of. Then, write a letter (we can send you an example) and send your letter to each person in your list. You can send out your appeal letter the old-fashioned way- via snail mail. Write a fundraiser letter, print it, sign it, mail it to all in your list, and include a self-addressed, stamped return envelope so people can easily respond. Online fundraising through Facebook or via email is more popular than ever; you can send out email appeal letters to your online network with the click of a button. Consider your social networks, your professional colleague, your email address book, even the various email lists you are on. Perseverance is key- spread the word as it as far as it can go. Tell everyone you know about your campaign. Ask them to e-mail out the campaign letter to everyone they know, and to ask their entire network to donate to your oversea trip-based project. Put it on the front page of your website. Link to it on your Facebook page, through Twitter, etc. Try to get your local media involved by suggesting story angles. 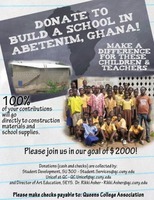 Take every opportunity to spread the word and get people talking about your Ghana project. The more people know about your fundraising campaign and the project, the more likely you are to reach your funding goal. Many people will donate to your cause if they see that you are real and it is of common good. And it is hard for people who do not know you to part with money without an incentive in return. What can you do to prompt many people to give to your project? Provide incentives, offer meaningful rewards at different levels of donation. Greeting! As you may have heard, I am traveling with a team of Italian architecture students to Ghana in a few weeks to use my architectural knowledge and design skills on a project which will positively impact hundreds of lives in an impoverished village in Ghana. We will be in Ghana for ten weeks months from ..., until ..., 2015. Our project will be at Abetenim, a village in the Ashanti Region and is organized by a local NGO called Nka Foundation. In our time at Abetenim, we will design a modern mud house and build it with the villagers. Our design will be an example to the villagers to help them overcome local stereotypes about buildings made of earth because they have several examples of mud homes that have eroded over time due to poor construction and water damage. I feel truly honored to be given such a worthwhile opportunity and looking forward to an overseas experience that is bound to change my life. As you know, the travel will involve paying for plane fare, food, housing, passport fees, immunizations, clothing, my project with the villagers, and others costs. Our design team will need to raise €6,000 for the construction of our design before (insert deadline, example July 1, 2015) for our team to go to Ghana. At first, the amount seemed overwhelming. After considering my circle of friends, relatives, and colleagues, however, I realized that if everyone in our team just reachs out, we could meet our fundraising goal. This is why I am reaching out to you to ask you to sponsor me to this trip. I really need your support on this endeavor. No amount is too small; anything you can give to help and will be greatly appreciated. If you would like to donate to our Ghana Project, please e-mail or call me with the amount you will be pledging, and you can send a donation, payable to (…), to me at the address below. Attached are photos of our destination and detail of our project there. If we raise the fund to go, we will return with lots of thank you gifts for our sponsors. We have made a selection of gifts we will bring home in exchange for the amount of money you gave to our Ghana Project. If there is a specific souvenir that you prefer to have; let me know before the trip. If you would like more information, please contact me, or e-mail to the project organizers via info@nkafoundation.org / www.nkafoundation.org. Thanks in advance for your thoughtfulness and generosity! PS – One of the most valuable ways you can support our Ghana Project is to forward this email to as many people as possible with a note vouching for me. Thank you for your help! We will receive a copy of a short film documenting the challenges and successes of this project from beginning to end. And we'll list you as a donor in the credits line in the video documenting the project. ____ PLEDGE €50 and MORE: Glass Bead Jewelry handpicked by us from a beadmaking workshop in the region or I will take a picture of whatever you would like to see of Abetenim and nearby villages i.e. the sunrise, moon as it looks, children at play, a laughing/smiling face, palm oil processing, cocoa trees, a shadow … so go ahead send us your request. We exhibit all of the pictures on our blog as updates... we will also email you the picture you requested. ____ PLEDGE €100, you will receive a length of traditional hand-woven kente cloth (about the size of a typical shawl), made in the region and a copy of the film. ____PLEDGE €400: For your generous contribution, you will receive Akuaba Fertility Doll, carved in wood and used by the Ashanti tribe to promote fertility, and a copy of the film. ____ PLEDGE €700 and MORE – an African Mask, carved in wood from the Ashanti tribe, and a copy of the film. ____ PLEDGE €1,370 and MORE – The famous Ashanti Stool an Akan Stool carved by a wood craved in a wood carving workshop in the region, and a copy of the film. ____ PLEDGE €400: For your generous contribution, you will receive Akuaba Fertility Doll, carved in wood and used by the Ashanti tribe to promote fertility, and a copy of the film. All donors will have their names enscribed in a book housed in the library. Personal invitation to visit us during or upon project completion to see the product of your giving. The invitation includes one-week accommodation and guided-tour of the regional sites. Flight tickets and land transportation not included. Circulation Desk - $1000 The famous Ashanti Stool craved in a wood carving workshop in the region AND a certificate of appreciation. Bookshelf - $200 Wishing you were here with us. Literary Classic - $50 An official - beautifully designed - certificate of appreciation, an acknowledgement in your name. Library Card $20 We will take a picture of whatever you would like to see of Abetenim village i.e. the school, the sunrise, moon as it looks, children at play, a laughing/smiling face, palm oil processing, cocoa trees, a shadow, the arts center, etc. A special page will be set up on our facebook page to exhibit all of the pics... we will also email you the picture you requested. Competitive sports events are great for fundraising. What's the big sport around you? Figure it out and make a fun fundraiser with it! Baseball tournament fundraiser? Soccer fundraiser? Bowling fundraiser? Skee ball tournament fundraiser? Ask around to see what what would draw the biggest (and most fun) crowd to your event and have a tournament. You can do an entry fee for the sports tournament fundraiser per person or per team and then have a bunch of little fundraisers inside the fundraiser. For example, you could have 50/50 raffles or just general raffles giving away prizes donated by local businesses. People like to be competitive so if they can do that AND be giving to a good cause, it's a win-win for you and your donors at your fundraiser! Bring together a group/league of soccer teams and host a fundraiser tournament. If each member on the 11 person team donates, at a minimum, $10, that’s $110 per team. The more teams the better! If possible feature a celebrity soccer player as a guest of honor, high-end silent auction and more. You may also include a concession stand that had been set up for the event. 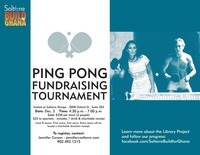 Invite your friends, family or co-workers for a friendly competition! Either play as doubles or singles. You could do both simultaneously if you think it’ll bring in more donations! Charge an entry fee to participate per team and gate fee for spectators. Teams compete for top bragging rights! Get someone to donate prizes. Getting your prizes donated by a vendor can assure your donors that 100% of the entry fee money is going to the cause. If the concept is new to you, begin with www.crowdfundingguides.com/The%20Crowdfunding%20Bible.pdf (Crowdfunding Bible). The first step is to begin to research crowdfunding platforms to gather information about which platforms will be best suited for what we are trying to achieve. The goal is to know what works and what does not in this particular crowdfunding platform. The guiding question would be: What are the best practices out there in light of your crowdfunding campaign for proposed project? The second step is to recognize: “You can’t do it alone”. Use viral marketing strategy, meaning ask people in your cricle of contacts to help spread the word via email, word of mouth or any other ways you can think of. You need help from a friend, family members, colleagues or a team of online volunteers to help you create and successfully run a crowdfunding campaign to generate money for your project. Your team will use information about our organization and project site together with detail on your project, social cause and professional objectives behind your participation in the project to create a compelling funding campaign and promote it via social media and other e-resource. Then, comes the most technical part, which is crafting your message to get people to support your cause, while staying true to your own personality, spirit or character. Keep in mind that writing a crowfundraising campaign is way different from the formal writing style. Yes, in the social media world, traditional messaging simply doesn’t work. Another important tool for crowdfunding is video appeal. Some crowdfunding platforms require that you create fundraising videos with photos of the host program and other projects that you have accomplished, as a pitch about why the viewer should support you project. The video needs to be under 3mins, it is said to work best for average human attention span today. I imagine you (the project initiator) would be ideal as narrator to explain and present the context, the 'why', the 'how' and the benefits, as well as mention previous success on Kickstarter or similar. Following which, you need to incorporate social media. We think it's vital to have Twitter, Facebook and a blog going for a few weeks before you launch anything on Kickstarter (or any other platform). However, the message must be persuasive, whimsical and must present a sense of completeness to the potential donors. If you are the funny person that can use humor to fundraise then go for it! Most of your potential donors are careful not to engage in conversations without understanding the context of that conversation. And remember, fundraising is a conversation and people will need a reason to give. After you have asked and received, it is essential to THANK those who gave and try to INCLUDE them in your work. NOTE: If the goal is to raise funds for your site-based volunteering/project visit then use Kapipal is a free (no commission) international crowdfunding platform. It's a generalist and so it allows you to fund any legal project. You can use these for your fundraising letter or crowdfunding campaign. They have been tested and they work well. You put it this way: "If we raise the fund to go, we will return with lots of thank you gifts for our donors. 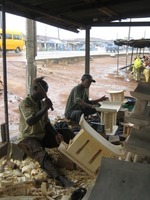 Our group will have the chance to visit some of the craft villages that surrounds Kumasi. We will have free time to go to see wood carving in Ahwiaa, adinkra cloth making in Ntonso, and kente weaving in Adanwomase and Bonwire. We will made a selection of gifts we will bring home in exchange for the amount of money you gave to our Ghana Project...."
Tell your backers: "We will be visiting the Kente Weaving village of Adanwomase, the village most famous for weaving the kente cloth of the Ashanti royal family. We got to try on the different kente clothes and dress up like Chiefs and Queen Mothers, and then buy you your gift of kente Stole." An example of Akua ba dolls from Ghana, which is a symbol of fertility. These dolls are used by the Ashanti tribe to promote fertility and to protect pregnant women. (suggestions of travel grants are welcome).